Do you like to eat cheese? Wich kind? i like it !but i can't always eat it !in my viewpoint,eating too much of them is bad for my health! 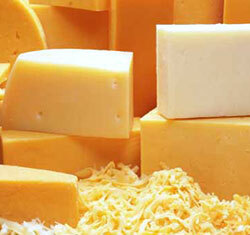 i like cheddar, swiss, parmesan, and of course the oowee gooweey mozzarella cheese. I am a confessed cheese-aholic! lol I love it... in just about every shape and size! I love all cheeses. Yummmmmmmmmmy. Yes i like very much cheese! I love cheese, dont have a favorite one, i love a lot of them. My whole family love cheese.They prefer a really mature cheddar,to anything else.They will also eat Edam,when given the choice.Myself,i like cheese,but i really have to fancy it. i like mozarella, its best, but i also like normal chess. Love just to bite it. i like some italian cheeses called provolone! wonderful! Yes!! Provolone is very good here in Italy! :D Thank you for reply! Ya I really like cheese. My favorite would have to be mozarella shredded cheese. Its just go good and tastes great added to almost any dish.